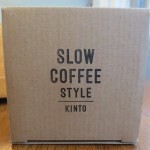 The Kinto Slow Coffee Style Series and the Hario Drippers encourage the kind of coffee brewing experience that we at St. Joseph Island Coffee Roasters aim to have: Slow, meditative, and delicious. We are offering two Kinto Carafe Sets (2 cup and 4 cup). Each set has everything you need to get started on your slow coffee experience. 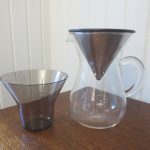 The beautiful stainless steel filter sits on top of the elegant glass carafe. All you need is your favourite St. Joseph Island Coffee Roasters’ coffee. 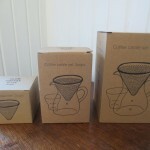 Also included in each set is a cup to hold the filter when you’re finished brewing your coffee. We sell the Kinto Stainless Steel 2 cup filter separately here. 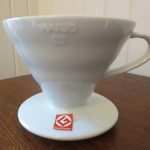 You might want to have an extra filter, or we recommend using it with our Hario V60 Drippers. 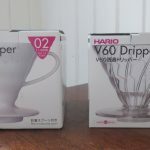 The Hario V60 Drippers are favourites of ours. 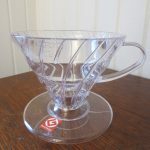 Using a Hario Dripper is an affordable way to make a delicious cup of coffee. 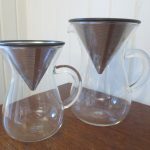 We are offering a ceramic dripper and a plastic dripper. Each unit comes with a measuring spoon. Filters are sold separately. 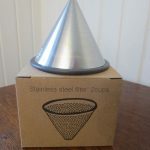 We recommend using the Kinto Stainless Steel 2 cup filter.